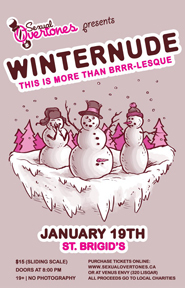 Winternude … This is more than BRRRlesque! Winternude …This is more than BRRRlesque! Come and witness the amazing sights and sounds, the bizarre and unbelievable feats, the glitter and spectacle as Ottawa’s favorite not-for-profit performance troupe The SEXUAL OVERTONES and their special guests takes the BRRR out of Burlesque and the winter chill out of your trousers! See the thrills, the beauty, the excitement and laughter -leave your cameras- but bring your oddities, as this will be one UNFORGETTABLE show! This year’s proceeds will be donated to Families of Sisters in Spirit, Venus Envy Bursary Fund, Harmony House and Pink Triangle. Costumes are highly encouraged (there are prizes to be won)!!! DJ Hobo and DJ Sweet Cheeks will be spinning your favorite tunes all night long so bring your dancing shoes and your sense of reckless abandon!